All neighborhoods associations are required to be incorporated with the Secretary of State. As a result, all neighborhood associations must also register with the Department of Justice, Charitable Activities Section, regardless of the amount of revenue brought in annually. Neighborhood associations can file their annual report either online through the Department of Justice website or by mail. 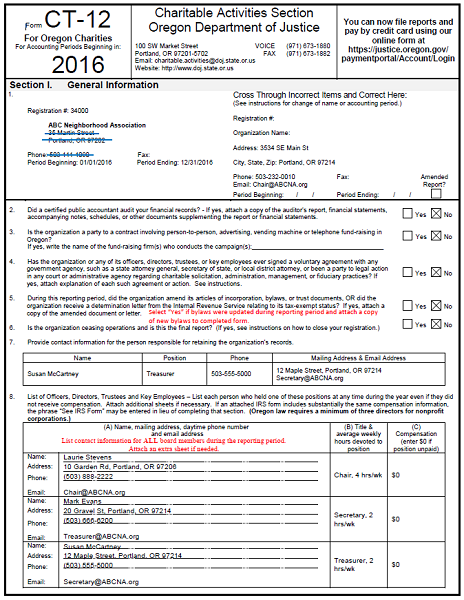 A preprinted hard copy of your report will be sent to the mailing address on file with the Department of Justice. If you do not receive this form, you can download a blank version from the Department of Justice website. See below for more information on how to fill out the specific form. Your neighborhood association’s annual DOJ report is due 4 months and 15 days after the end of your organizations accounting period. To find your organizations reporting period, search your neighborhood’s name on the Department of Justice database and select the corresponding link. The database will provide you with the reporting period that you submitted your last report for. To get your current reporting period, add a year. To calculate your due date, add 4 months and 15 days to the last day of that reporting period. Neighborhood associations can be reimbursed for $20 of their annual filing fee. To receive reimbursement, please email or mail in a reimbursement request form (download PDF version here) and a copy of your annual report.